In 2001, the Water Supply and Sanitation Collaborative Council (WSSCC) asked P&LA to advise on making sure that the unfashionable issue of clean water and safe sanitation was not ignored at the World Conference on Sustainable Development (the ‘Earth Summit, ‘Johannesburg, August-September, 2002). Presenting the key messages and WASH logo to all delegates and media by both conventional methods and by the placing of WASH campaign materials in every toilet and washroom used by conference attendees – in hotels, restaurants, conference centres and committee rooms. The result was the ‘It’s the Big Issue’ campaign which confronted delegates and media from the moment they arrived in Johannesburg until their departure ten days later. ‘It’s the Big Issue’ flyers and adverts greeted conference arrivals at the airport; street light ads and banners lined the route to the city; leaflets, posters, drinks mats, and mirror stickers were found by delegates in bathrooms and toilets of hotels, restaurants, and all conference venues, often distributed by volunteers wearing WASH T-shirts and caps. The two-minute ‘It’s the Big Issue’ publication (see below) was placed before every delegate and media representative while a walk-through WASH exhibition was erected at the two main conference venues. View pdf of the ‘It’s the Big Issue’ publication. 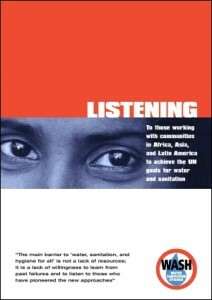 As a follow up to the WASH campaign, P&LA proposed to the WSSCC the idea of a LISTENING report. The introduction drew together some of the fundamental lessons learnt and gave voice to some of the most strongly felt concerns of practical pioneers in water, sanitation and hygiene in some of the world’s poorest communities.